William’s micro-sized item contains the same tools contained in the original full-sized chest. But his skills extend to more than surface appearance, for all the mini-tools work as they should - even the saw has 160 teeth to the scale inch, as it should. Apparently the hardest thing to make was the folding rule, as it has a five-leaf hinge and is barely 7 mm (0.30 in) thick. 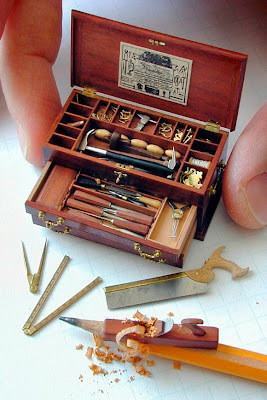 Other items include details such as joints and engravings - oh, and the chest's lock works, too. William spent many childhood hours gazing at the myriad of models of all kinds on display in the Smithsonian Museum, Washington, DC - and if you’ve ever visited, you will understand exactly how he must have felt. ‘Awe’ is probably the best way to sum up this writer’s reaction when he first went there. Today, William lives in Kansas City, Missouri, where he often consults with museums on their gallery proposals. 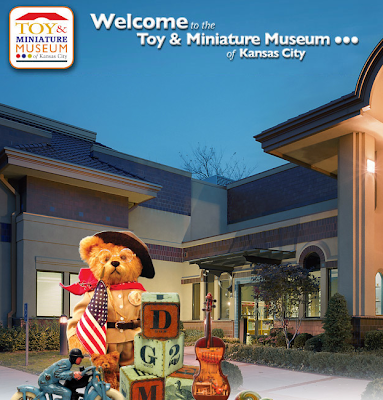 He’s also associated with the Toy and Miniature Museum there, where he has a collection of miniatures on display. Thanks to the Fine Woodworking website for info, where you can see and hear a fascinating narrated slideshow. Visit the Toy and Miniature Museum of Kansas City here.